The English Schoolhouse: Remember when I said I was gonna write a children's book??? Remember when I said I was gonna write a children's book??? 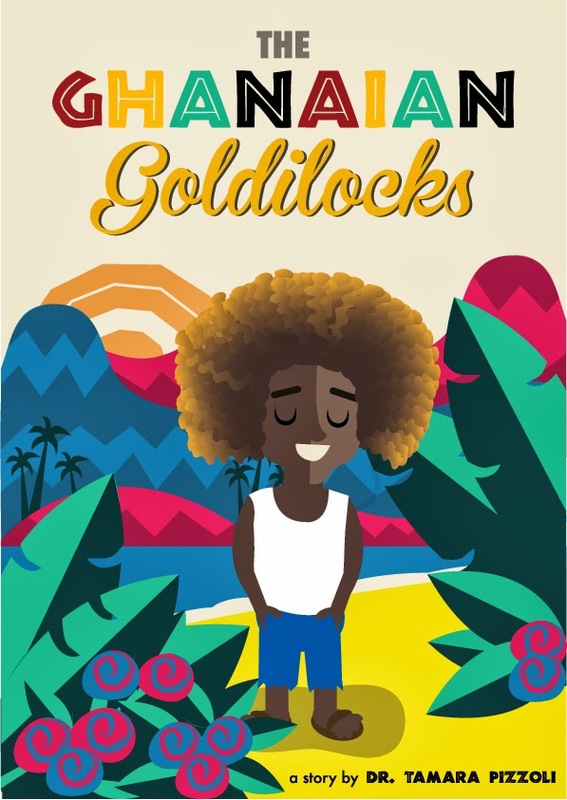 The title is The Ghanaian Goldilocks. It's a modern twist on the classic tale set in the city of Accra, Ghana. There are a few changes...for one, Goldilocks is a boy named Kofi. The staples of the well-known tale have been adjusted to reflect the Ashanti culture. Instead of porridge there is fufu, instead of three chairs we find stools for seating, and kente cloth covers the three beds upstairs. There are no bears. Phil Howell's work is genius, he's worked with the likes of Kanye West, and it has a price that I would never try to haggle. See this is the thing about living in Rome that I don't think I'll ever be accustomed to...the culture of bargaining. This I say 50, you say 30, we agree on 40 is really for the birds. The American in me just can't get with it. I see Phil Howell's work. I like it. I ask him to illustrate. He says yes. I ask for the price. He gives it. I either agree or disagree. I buy or I don't. Like you can't just walk into Chanel and say, "Omg I looooove that bag, but I'm not paying 800 euro for it. I'll give you half." They'd say, "Ma'am or sir, there's the door." Work HAS VALUE. Our society is structured in a way that value is represented for work monetarily. If you don't want to pay full price, perhaps that's because you don't think what you're getting is worth the price. And I KNOW that the work done at or via The English Schoolhouse is worth every penny. So back to Phil, he quoted me a price...a price that is actually lower than what he could charge I imagine, but with a new school and the costs associated with it I really can't permit myself to just drop that kinda cash all in one lump sum right now. But is it worth it? Abso-freaking-lutely. So what to do? Get creative. Fundraise. It's coming soon. For now, I invite you to swoon over the cover...and be on the look out for upcoming opportunities to get The Ghanaian Goldilocks where it should be, published and held in little hands around the globe. Looking forward to read this book to my babies. Can't wait!! !